1 photographer. 1 art director. 72 minutes. It’s been a while since we got together for minute:72. We both have been traveling for spring break and photo shoots. But here we are back at it again. This time we wanted to meet in nearby Seal Beach. The only Starbucks was one inside a grocery store, so there we met, grabbed a coffee and searched for a paper to get our inspiration word. Then we encountered a slight problem – there was no paper. We asked a clerk if there were papers and she directed us to a CVS pharmacy across the parking lot. Our word today is: unveils. To reveal. To bring to light. Uncover. We were sure that we could find something that said “unveils” to us near the beach, so we headed there right away. As we approached the Seal Beach pier, we spied peeling paint of a lamppost unveiling the metal beneath it. The sand also was unveiling things that were hiding beneath it as the wind blew it around. As the ocean washed ashore it unveiled seaweed and left it laying on the wet sand. 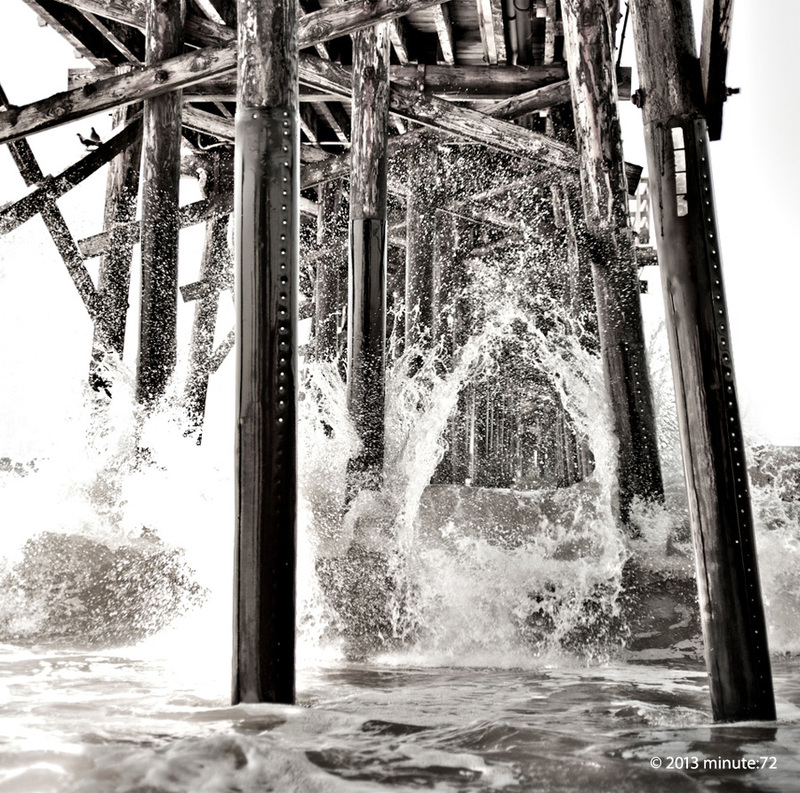 We shot all of this, but the most interesting occurrence of “unveils” was the ocean rising up into the air as it hit the pilings of the pier. Each time it seemed to raise its arms, reaching into the air from being held down for so long – and with such power. Eric got pretty wet as he shot this unveiling power of the ocean. One image stood out from the rest. This frozen moment says unveils to us. This entry was posted in Uncategorized by -dg. Bookmark the permalink. Amazing! Did you time it? How long did you have to wait, how many pictures did you have to shoot to get this one? That Eric got wet is no surprise, but how wet? And for how long? Is how the light falls on the right hand side and its alignment with the brown beams on the left on purpose? And did you wait for sunset to get that light colour? Imagine Eric out of the picture and it’s a perfect composition. This particular shoot started just after 10am. We work with what we are given during the 72 minutes for each shoot. If it’s cloudy, we hope the sun comes out to give us some light as in minute72.com/prepare : If it doesn’t come out we still work with what we’ve got. Other decisions are made when we are editing after the shoot when we choose the hero shot – black & white or color : color treatments to photo or not : which photo is the favorite, etc.